"If a house is on fire, no one wastes time putting water on nearby houses just in case the fire spreads. They rush to pour water where it will do the most good - on the burning house. The same strategy turned out to be effective in eradicating smallpox." ​ Dr. Foege took a stand and stopped the world's most notorious killer. Click on the pictures below to read about smallpox and Dr. Foege who stood against the disease. The smallpox virus under microscope (CDC,1849). Dr. William H. Foege, seated (CDC, 1980). 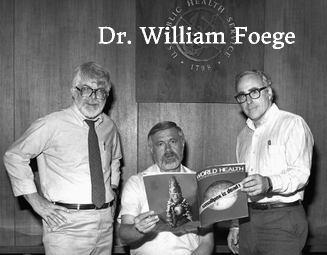 Dr. Foege's method changing the world (CDC,1968).